WK Bikes has introduced a fully-loaded 30bhp, 250cc sports bike to their range. The WK SP250 is a fully-faired sports machine boasting a liquid-cooled, SOHC, four-valve motor producing a lively 30bhp and driving through a six-speed gearbox. The motor includes a single balance shaft to keep it running smooth at all revs. The full-cradle steel chassis design is based on the top-selling WK SP125 design and features a single shock rear suspension system and upside down front forks. Large diameter, twin hydraulic front discs combine with a single rear hydraulic disc to slow the bike down. 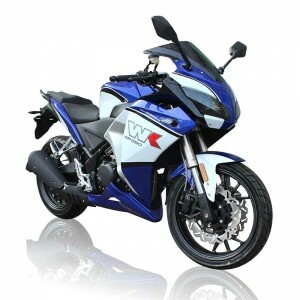 WK offer a varied range of both bikes and scooters at attractive prices.